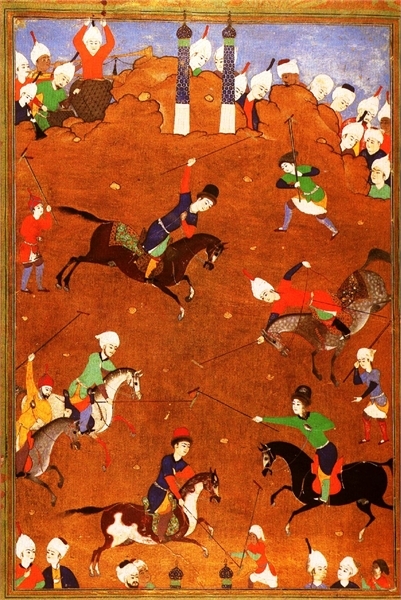 In the early 19th century, the modern game of polo was derived from Manipur, India, where anyone who owned a pony was a welcomed participant. Pulu, the name of the wooden ball that was then used in the game, was anglicized into polo when Lieutenant Joseph Ford Sherer visited and played at the historic Imphal Polo Ground in the 1850s. T. B. Drybrough's illustrated guide Polo, published in 1898, just 40 years after Sherer's visit, reflects how Britain was largely responsible for the sport's westward expansion. Drybrough provides detailed descriptions of rules, accessories, club management, polo ponies, and much more in his work. That same year, an American athletic company published a guide, Spalding's Official Roller Polo Guide, an early variant of the sport. Now polo is played professionally all around the world, from the Dominican Republic to Switzerland, and is an active sport in over 70 countries. In 2015, Argentina, had nine of the top ten ranked polo players. Elephant polo is played in South Asia, yak polo is played in Mongolia. Polo is a respected sport in each place in which it is played, and is inexorably linked to the rich histories of a great many places. World Library offers a wealth of information about polo's historical significance, including T.F. Dale's work Polo: Past and Present.